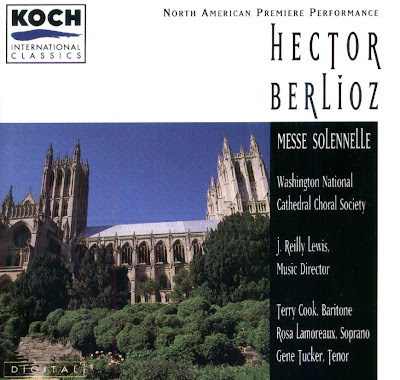 The Messe Solennelle is the earliest large-scale work by Berlioz to have survived. It was composed in 1824 when Berlioz was 20 years old. Berlioz went to Jean-Francois Lesueur for some instruction in composition. In his early years he was very productive under Lesueur. According to Berlioz's Memoirs he composed a cantata, an opera, A Latin oratorio, and a dramatic scene before embarking on the Mass. All these works, including the Mass, were soon destroyed by the composer. The Mass was performed in 1825 in the Church of St. Roch, Paris and again in 1827 in the church of St. Eustache before Berlioz turned against it. He decided to burn all the sheets of vocal and orchestral parts of the Mass - the autograph survived. It was Franz Moors, a school teacher in Antwerp, Belgium, who discovered of the autograph among a small collection of miscellaneous music kept in the organ gallery at the church of St. Charles Borromaeus in 1992. An inscription on the manuscript helped to explain how it got there: "The score of this Mass, entirely in Berlioz's hand, was given me as a souvenir of the longstanding friendship that binds me to him," signed "A. Bessems, Paris 1835." Bessems was a Belgian violinist, born in Antwerp, who went to Paris to study under Baillot at the Conservatoire in 1826 and thus enrolled at the same time as Berlioz. He probably played in the second performance of the Mass in 1827. He also played in Berlioz's Paris concerts in 1835, at which point - it is assumed - Berlioz gave him the Mass manuscript, perhaps in lieu of a fee. Bessem's career thereafter diverged from Berlioz's, since although he remained in Paris for most of his life, he specialized in chamber music and taught privately. After his death in 1868 the manuscript passed to his brother Joseph, who was in charge of the music at St. Charles Borromaeus in Antwerp, and after Joseph's death in 1892 it remained in the old oak chest in the oragn gallery where Moors found it a hundred years later ! My verdict: this recording is a real gem, Thank You Mr. J. Reilly Lewis ! The Compact Disc was released by Koch International Classics, 1994, (DDD). Koch 3-7204-2 H1.